Happy Holidays to all of you- my friends! Thank you for your continued support and encouragement this past year. You are all sensational! From Maggi: Eric's single from this album will be available soon for download on CD Baby and other sites. Stay tuned! CHRISTMAS will feature a host of Broadway Stars to support the Dr. Carol Channing-Harry Kullijian Foundation For The Arts in its mission to promote the arts in public education. A portion of the proceeds from the sale of this CD will go directly to support schools in Union Beach, New Jersey who lost all of their musical instruments after Hurricane Sandy and have been forced to cancel their music classes and programs indefinitely. A VERY BROADWAY CHRISTMAS features the talents of Matthew Morrison (Tony Nominee - Light In The Piazza; South Pacific and Fox Television's GLEE), Susan Egan (Tony Nominee - Disney's Beauty And the Beast; Cabaret; Triumph Of Love), Stephanie J. Block (Wicked; 9 to 5 and currently starring on Broadway in The Mystery Of Edwin Drood), Krysta Rodriguez (The Addams Family and newest co-star on NBC Television's SMASH), Cathy Rigby (Seussical; Peter Pan); Eric Kunze (Miss Saigon; Les Miserables; Damn Yankees), and more - and featuring a very special reading of “The Night Before Christmas” by impressionist Rich Little and all of his voices. 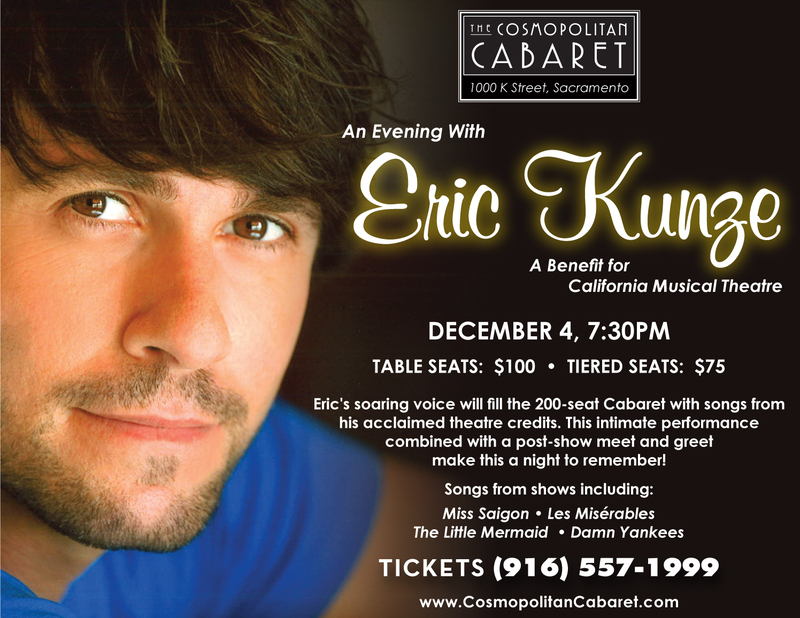 What a fantastic opportunity to see and hear Eric "up close and personal" in an intimate setting, singing songs from his favorite shows. Seats are very limited! 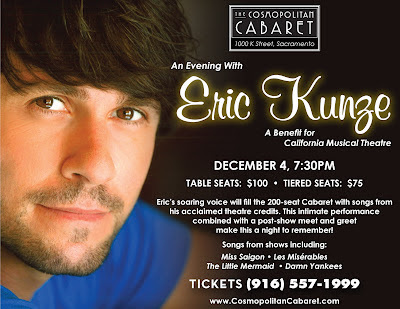 Cabaret appearance in Palm Springs.